OAKLAND, Calif. -- Paul George and Russell Westbrook ran Stephen Curry, Kevin Durant and the Golden State Warriors right off the floor from the opening tip. "They're one of the best teams in movement, in player movement, in ball movement," George said. "So we had to match the physicality as well as their pace. I thought that was the key tonight. Our motor was ready for that intensity." Durant scored 33 points but didn't get as much help from the cold-shooting Splash Brothers of Curry and Klay Thompson, who added 21 and 12 points, respectively. They combined to go 11 of 27 from the floor and 4 for 15 on 3-pointers as the Warriors lost for the third time in four games. They lost their tempers, too -- as in five technicals total. "It was a rough night," Curry said of the officiating, while insisting that wasn't what lost the game. "We were way worse than the officials were," coach Steve Kerr said. "We got completely outplayed." Durant said it's up to the Warriors "to hold ourselves accountable out there." "That was the game right there, the first quarter and they have 42 points," Durant said. "You've got to give them credit, they came out with a lot of energy and we didn't match it." "It didn't feel like us, that's for sure," Kerr said. "We're out of whack right now. We're just not playing the way we normally do in terms of the ball movement, the pace and the spacing. And our defense has not been good either. It's been a struggle." It had been since April 18, 2012, against the Lakers that the Warriors never led in a home game. 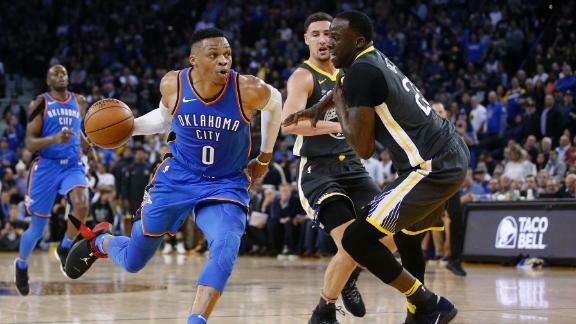 Russell Westbrook and Paul George combine to score 72 points in Oklahoma City's 20-point win in Golden State, but the story of the game is the physical play and Draymond Green getting ejected after a pair of technical fouls.